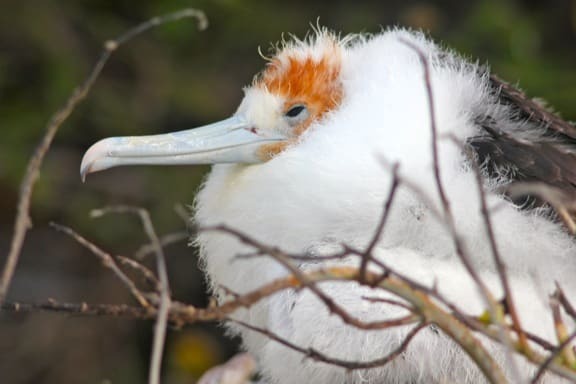 We had no idea what to expect when Ecoventura invited us to join their small ship eco-cruise to the Galapagos Islands back in 2011. The archipelago has been famous for its remarkable array of endemic species ever since Charles Darwin made his famous Voyage of the Beagle back in the 1830s. But the Galapagos was a dream destination we didn’t expect to be able to visit so early in Green Global Travel’s evolution. Our once-in-a-lifetime trip came together so suddenly, we had no time to do our usual advance research. From the moment we set foot on Genovesa Island, we were blown away by the sheer diversity of species that could be found in almost shockingly close proximity. Although we walked a total of maybe 100 yards over the course of several hours, we saw a vast array of Galapagos Birds. There were nesting Swallow-tailed Gulls and Tiger Herons fishing in the shallows, Magnificent Frigates soaring overhead, and two different types of Boobies (Red-Footed and Nazca). Birds were everywhere we looked– on the beach, on the rocks that lined the shore, in the bushes, in the skies above– with tiny squawking babies so close to the path we could’ve touched them. It was like no place we’d ever been before, and like no place we’ve been since. What follows is sampling of some of the incredible birds we saw during our week-long journey. 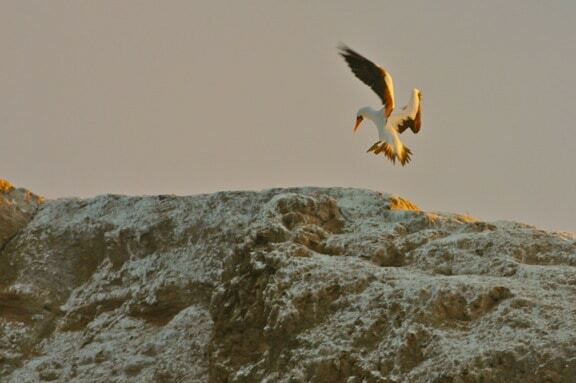 A Nazca (or Masked) Booby comes in for a landing on top of Kicker Rock at sunset. 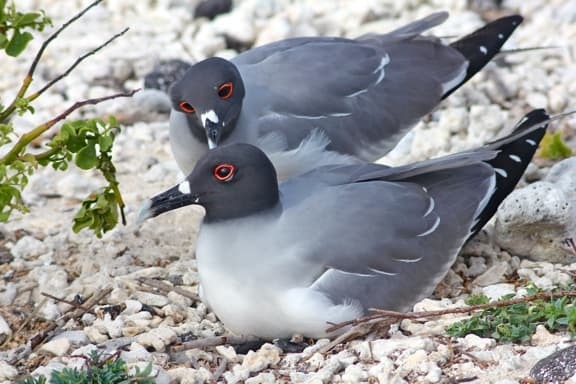 A mating pair of Swallow Tailed Gulls nests on the rocky beach of Genovesa Island. 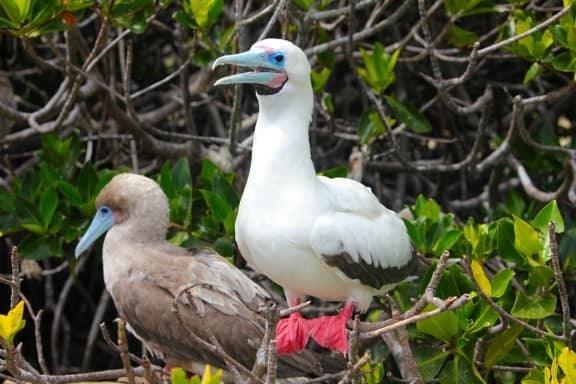 A pair of Red-Footed Boobies nesting on Genovesa Island. 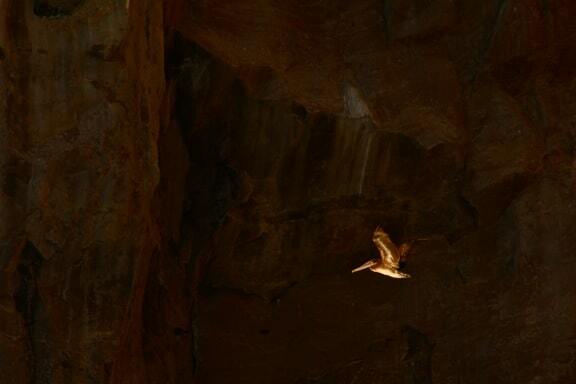 A Pelican flies into the sun’s spotlight in front of Kicker Rock. 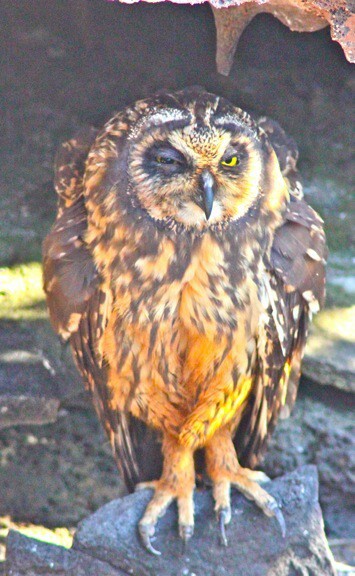 A rare sighting of a sleepy Short-Eared Owl during daylight hours on Genovesa. 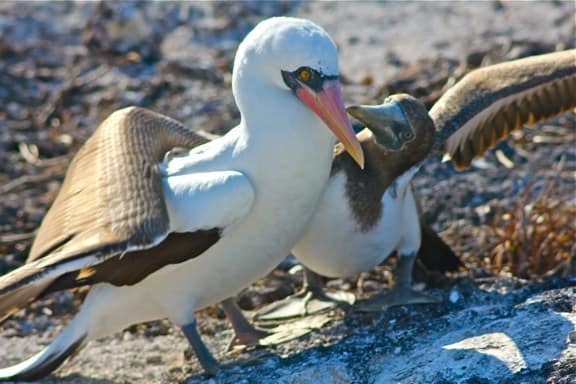 A hungry Nazca Booby baby urges his mom to feed him. 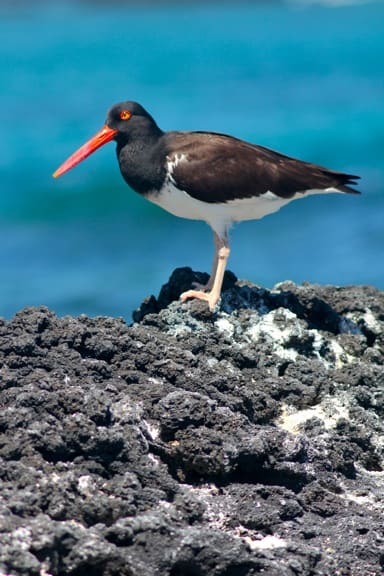 A Galapagos Oystercatcher protects its eggs from a hawk hovering overhead. 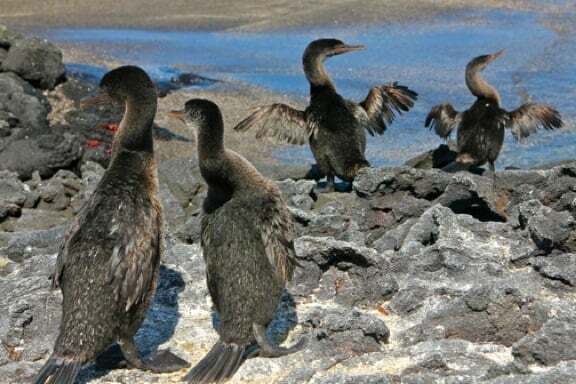 A mating ritual among rare Flightless Cormorants on Fernandina Island. 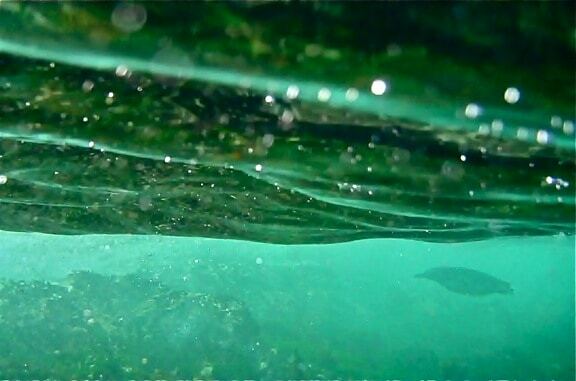 Snorkeling with Galapagos Penguins in Tagus Cove, off Isabela Island. 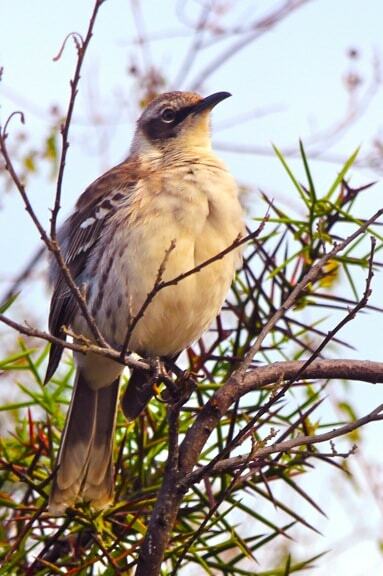 The islands’ most aggressive (and noisy) avian species, the Galapagos Mockingbird. 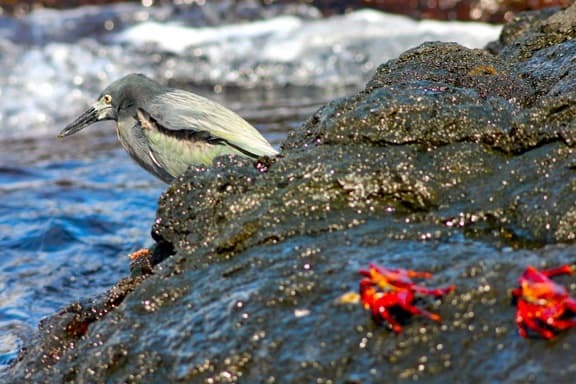 A Lava Heron fishes along the shore of Santiago Island. 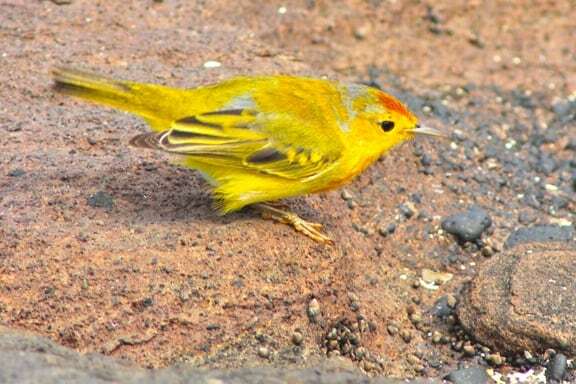 The brilliantly colored yellow Mangrove Warbler. 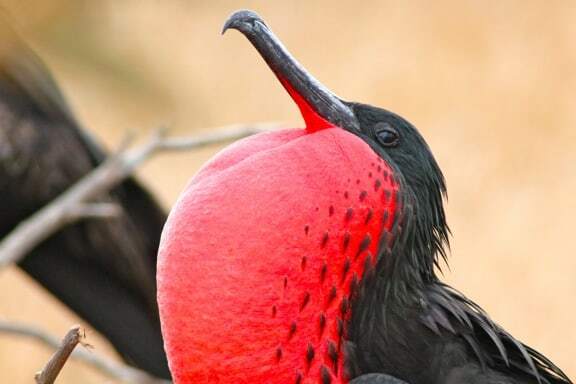 Male Magnificent Frigate inflates his pouch to woo females on North Seymour Island. 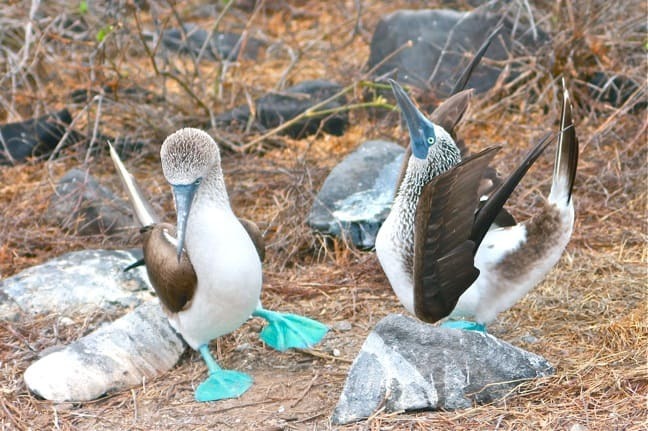 Blue-Footed Booby mating dance (stampy feet and sky-pointing) on Espanola Island. 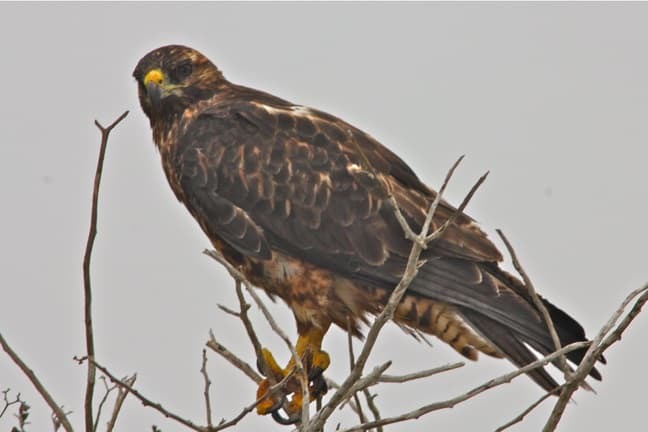 A Galapagos Hawk watches for prey on Española Island. 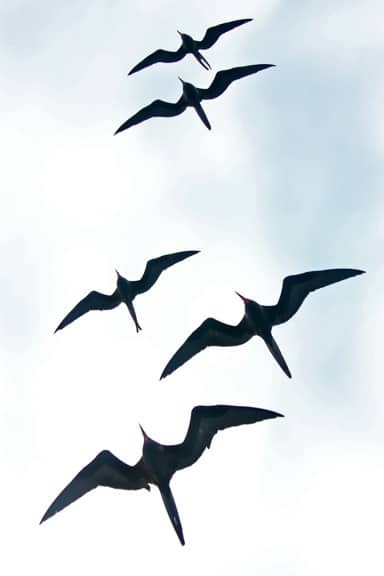 A flock of Frigates soars in formation on the updraft from our ship.